These letters of an Irish family from New Jersey detail forgotten aspects of the Civil War and present a view of the war from the immigrant's perspective. 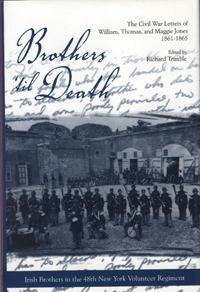 Brothers ‘til Death is a collection of over 150 letters found in the proverbial shoebox in a Red Bank, New Jersey attic. Most of them are from two brothers, William and Thomas Jones, who served in the 48th New York State Volunteers from 1861-1865, to their sister Maggie, a schoolteacher. The collection also contains correspondence from friends of William and Thomas. Thomas and William's regiment, the 48th New York, served in the now forgotten coastal campaign of the Civil War. The remarkable coordination of navy and blockade made an invaluable contribution to the Union's ultimate success, yet until the present volume, this aspect of the war has been largely ignored by the scholarly community. By providing a primary source detailing the experiences of soldiers in the coastal campaign, the book fills a gaping omission in existing literature. The letters also provide much-needed and valuable insights into the election of 1864, the emancipation proclamation, Lincoln's death, the virtually unknown Florida expedition, life in a New York City hospital ward, and the siege of Petersburg. Moreover, one of the brothers, Thomas, fought in the assault on Fort Wagner, made famous by the movie Glory.